Hey momoluvers, it's Momo and today I'll be showing you how to make your trip to Universal Studios epic! Universal is huge and if it's your first time, it can be very confusing. I think it's always helpful to have someone experienced tell me the ins and outs of something, and I happen to be educated on this subject. I have done hours of research in preparation of my trip and I wanted to create a thorough guide to everything the park has to offer. Universal Studios is truly the most magical place in the world. The strenuous time and effort that has been put into the amusement park is evident in the mass crowds and satisfied customers. Although, to call this place an 'amusement park' is downright insulting. This place was literally like walking into the movie set and enjoying the sites and shops like a real wizard! If I missed anything, please let me know in the comments below. Without further ado, I hope you enjoy this tutorial and have fun making plans for your trip! To kick it off, a schedule is key. Sure, it's fun to go on vacation on a whim and go with the flow, but having a plan is always helpful. It doesn't have to be a strict itinerary, but having an outline of the things you want to do or visit is a necessity. I would also suggest having a list of items you would like to purchase while you're there. If you're not a big researcher like I am, or you just want to be surprised, this isn't an important step for you. Personally, I didn't have that much money to spend on merchandise, and I wanted to plan accordingly. I started at the Universal Store Website and combed through my options. It's pretty fun to peruse the merchandise without a throng rushing me elsewhere as it would in the park. I walked into each shop knowing exactly what I was going to get so I didn't have to slowly muddle through the crowd. Don't know exactly what to pack? Packing the wrong clothes can lead to a miserable time, and you want to have fun in the park! Bring sunscreen because the sun is so hot you will burn quickly without it. Pack either tank tops or short sleeve shirts but definitely no long sleeve. The humidity and heat can get so intense midday that long sleeves are murder (I speak from experience). Also be sure to pack shorts, for the same reason. You can get super cheap rain ponchos at a drugstore because Florida is known for pretty unpredictable weather. We got rained on twice and had to sprint back to our hotel in thunder. It was an awful experience but it gave us something to laugh about later! Also bring one light sweatshirt or sweater because some of the restaurants can be pretty cold. Bringing a backpack with all of the essentials (Phones, park passes, water, etc.) is extremely important. When going on rides, lockers are available that you can put your backpack in. Having comfortable shoes is KEY. I cannot emphasize this enough, especially since I have had back problems for a large portion of my life. I packed shoes that were extremely uncomfortable by the end of the day. At gift shops, they were selling Sanuk flip flops. These shoes saved me from some intense pain each day. Also make sure that you book a hotel months in advance. Both times I've gone, we have stayed at Lowes Portofino Bay Hotel and it was amazing. The hotel is modeled to look like Italy, and it was on a beautiful lake that lets you ride a boat to the parks and back. Much better than walking! I also took photoshoots here each day which you can see on my VSCO if you want. I also absolutely loved the on-site restaurants because we had several delicious options without having to go into the parks. See more about food later. In no particular order, here are all of the places I ate. Revenge of the Mummy: This ride was perfection. I hate rollercoasters and this was absolutely flawless. It's part simulation and part roller coaster complete with intense drops and frightening twists and turns. This rollercoaster was just enough to scare me, but make me want to ride it three more times! I highly recommend this to anyone over 10, just because the simulations may scare some younger kids. Transformers 3D: This was a fun simulation that is great for anyone into transformers. Personally, I don't think it was all that jazz, but it was enjoyable. The line wasn't too long and the simulation was very realistic. I would recommend this to anyone who wants a fun ride, but going on it more than once seems pointless. Flight of the Hippogriff: This was the first rollercoaster I've ever ridden. It wasn't too fast, but it wasn't a little kiddy ride either. This is great for younger kids who are just starting to be introduced to rollercoasters. I rode this one twice and it was quite enjoyable both times. The ride is very brief, lasting for only about 20 or 30 seconds, but I only waited in line for 10 minutes, so it was definitely worth it. Dragon Challenge: Wow. Wow, wow, wow. This ride is killer. The dragon challenge acts as if you are riding a dragon and swerving through the air and diving and taking sharp turns. The only way I can explain this is I felt like I was being pulled inside out. It was so exhilarating and so well done that I rode this five more time. I highly, highly recommend this ride to anyone looking for a thrill. I would not recommend this for anyone under 12 because this is absolutely intense. Escape from Gringotts: One word: disappointment. I waited in line for an hour and 20 minutes to ride this simulation/rollercoaster and may I just say it was not worth it at all. It's not that the ride was bad, it's just that this ride is always so high in demand that the line is hardly ever shorter than an hour. Let's just figure for a moment that the wait was 20 minutes. In that case, nice! The simulation takes you through Gringotts bank vaults as you come across Harry, Voldemort, Bellatix, and more characters from the film. It's exciting, but certainly not as incredible as Revenge of the Mummy. If you want more of a storyline ride, try this one. I definitely would not ride this again, because the wait was a pain in the neck and hardly satisfied by the ride. Just not worth it, sadly. Harry Potter and the Forbidden Journey: jump scare spiders and dementors. This one was very enjoyable. The wait wasn't awful, figuring that you travel through the greenhouse, Dumbledore's office, the Dark Arts classroom, and a hallway full of conversing portraits. The ride itself is fantastic. Another simulation with some real props proved to be very fun. You swerve through the Hogwarts's grounds and even encounter a creepy cave with jump scare spiders and dementors. I would ride this again, and would recommend it for anyone over 8. Some of the props can be scary for younger kids so precede with caution. Despicable Me: Lastly, Despicable Me. This was one of the first rides as you walk into the park, so it just seemed practical to ride it. It was a cute simulation that was surprisingly realistic. I wouldn't ride it again, just because it's kind of a one time thing. You basically are becoming a minion and you have to pass a minion test to see if you qualify. You sit in a bench with three other people and watch a 3D simulation play on a screen. I would recommend this to anyone wanting a cute and fun ride. Mythos: This is rated the #1 theme park restaurant in the world. Wow, right? Last time I came here, they had the most incredible sushi I've ever eaten so upon returning, I fully expected to get the same thing again. Unfortunately, they removed this item from the menu so I had to search for something else. I didn't see anything I would have liked, so I got a burger but expected it to be as incredible as the sushi. Even more unfortunately, the burger did not live up to expectations and I was very upset. It's not that the burger was bad, I just expected it to live up to the '#1 theme park' title. NBC Sports Grill and Brew: This restaurant is located right inside of the Universal park and it was so good we came here three times. There is a vast menu with so many amazing options for everyone. I got sliders and burgers here that were cooked very well with superb flavor. I highly suggest trying this out at least once. Leaky Cauldron: Here I got fish and chips and may I just say I hate fish. This, however, did not affect my experience. The fish was cooked in tons of butter to flaky perfection. It was absolutely delicious and I got pumpkin juice to drink of course. My Dad got Fishy Green Ale which was recommended to us, but it was incredibly sweet. It was a lime blueberry kind of flavor with popping pearls in the bottom and so incredibly sweet. It was in a huge cup and the four of us combined barely finished it. Save your money and get a pumpkin juice. Florean Fortescue's Ice Cream Parlour: This ice cream was so delicious! The first time I got a soft serve butter beer cone because it was on their featured list. I was very disappointed, it did not taste much like butter beer and I definitely would not recommend this or get it again. The next time, I got lavender and earl grey flavor and it was perfection. I love lavender and this was just subtle enough that you could taste the flavors. Absolutely delightful, I would recommend this flavor to anyone. Plus, they give you a ton of ice cream and a little paper sleeve that I kept as a souvenir! Trattoria Restaurant: This is a lovely little brunch place located at the Portofino hotel. I got berry pancakes and they were wonderfully cooked! They were soft on the inside and slightly crispy on the outside. Three huge pancakes were too much for me, but absolutely delicious. Sal's Market Deli: This was like a quaint little grocery store with a variety of food, drink, and dessert. I got a cheese pizza and it was good. Not too much to it, it wasn't fantastic, but it was at the hotel which was convenient for my very tired feet. Starbucks: You already know what Starbucks is and it wasn't any different in Universal, but I'll just mention the delicious egg, cheese, and bacon I got here for breakfast twice. It was crispy and flaky and a perfect flavor combination. It's was very convenient that this was at the hotel so I didn't have to travel to the park just for breakfast. Croissant Moon Bakery: I came here for a chocolate croissant and a french toast muffin. The muffin was so delicious, however slightly dry. The croissant was not flaky as a good one often is, but thick. It also was filled with dark chocolate, not milk chocolate. This isn't bad, I just would have preferred milk chocolate. They also have funnel cakes, which I planned to get, but forgot about it. The Three Broomsticks: I didn't eat here this time, but I remember the food being very tasty. This is located in Hogsmeade and the aesthetic of the restaurant is certainly accurate. I came in just to get a butterbeer at the Hog's Head pub so it's a good pop in place with tables outside to sit at. Basically if you're not planning to eat here, at least pop in for a cold drink and a break in the shade. The restaurant is decorated beautifully and very accurate to the films. In order of my favorite to least favorite here are all of the merchandise I purchased, grouped by products and sweets. Also, some of these products are not featured on the official universal site so the some links are to different website with different prices. 1. Luna Lovegood's Wand ~ 39.95: The wands are absolutely amazing. Made of fine resin, the wands are very heavy and beautiful carved. The box they come in is very nice as well, with the name of your character on the side. It's a bit pricy for a prop, but I think that any Harry Potter fan should get at least one of these.Time Turner Key Chain ~ 12.95: The time turner is an absolutely beautiful piece. The necklace is so expensive, I thought the key chain was a good compromise. It is a heavy, quality piece, and the sand inside the hourglass moves around. I think 12.95 is just the right price for this and I would recommend it. 2. Light Up Hogwarts Castle ~ 14.95: I love paper crafting. Any complicated craft I love and this was really amazing. The sheets are precut and you just have to fold and assemble. I'll admit- at certain parts, the instructions were faulty so if you purchase this, look more at the picture than the description. It comes with lights that you string through the castle and it looks so amazing. I absolutely love this and the cheap price makes it all the more better! 3. Marauder's Map Mug ~ 18.95: I wanted the Marauder's Map so badly,, but I couldn't spring the 50 bucks so I settled for the mug. Surprisingly, this was just as great as the map! I love collecting unique mugs and this is one of my favorites. The mug is sculpted so that parts are indented and popped up and I think it's a nice touch to the beautiful design. 4. The Quibbler with Spectrespecs Prop ~ 7.95: I am a diehard Luna Lovegood fan and figuring that she wears the spectrespecs makes it such a unique piece. You can take off the spectrespecs and put them on because they are amazing! There are little rainbows over everything you see! After you take off the glasses, you can hang up the Quibbler cover because it is so cute and detailed. 5. Gryffindor Crest Banner ~ 26.95: This was totally worth it! The banner is huge and very good quality. The layered felt is really thick and the embroidering is gorgeous. This looks so epic on my wall and I'm so happy I got it. 6. Pygmy Puff ~ 14.95: Oh my goodness. These are the cutest things ever. This is literally a ball of fluff. It is so soft and cute that I couldn't pass it up. There are smaller ones on keychains, but those were 10.95 so I figured for 5$ I might as well get a bigger one for my shelf. 7. Butterbeer Collectible Mug ~ 6.95-8.95: I can't remember the exact price of the mug, but it was definitely a product I wanted coming in. It's a very basic plastic mug with a simplistic design, but I love it! It wasn't too expensive, and picking it up at a cart in Hogsmeade really made the experience better! 1. Fizzing Whizbees ~ 9.95: The Fizzing Wizbees were probably my favorites. The chocolate tastes very good and the raspberry pop rocks are a nice surprise. They're even in the shape of little bees for added cuteness! These were so good, I would highly suggest trying them despite the priciness. 2. 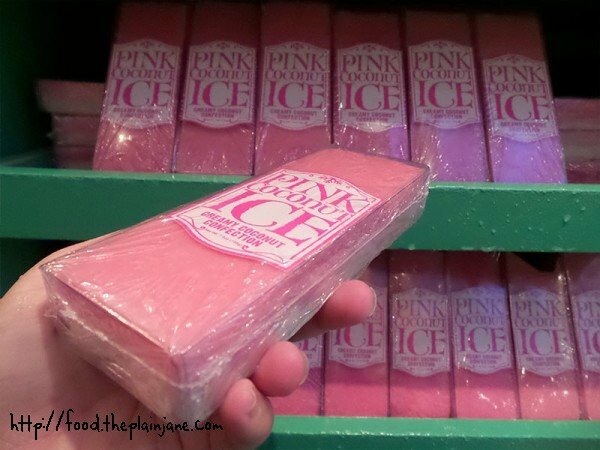 Pink Coconut Ice ~ 9.95: This wasn't mentioned in the books, and now I'm starting to see the marketing ploy. This is a huge hunk of coconut fudge. Genius. It is the best fudge I've had that wasn't freshly made, so I rate this high on the list. I really enjoyed it and it's lasted for a long time so I definitely recommend this. 3. Caramel Cobwebs ~ 7.95: These aren't mentioned in the books either, but I heard they tasted like the foam on top of the butterbeer so I had to try it. They really lived up to expectations. It wasn't too expensive for caramel chips imprinted with spider webs, so I would say go for this one. Plus, the tiny box is adorable. 4. Sherbet Lemons ~ 12.95: These are basically lemon drops in a collectible Honeyduke's jar. This is so much better than lemon drops, however. Each one is coated in granulated sugar and if you let it melt in your mouth, it lasts for a long time. There are a lot in the jar, about 100 after I counted. Now I know why it's Dumbledore's favorite! 5. Love Potion ~ 9.95: I purchased this at Weasleys' Wizard Wheezes and it's a really lovely product with 'liquid sweets' inside. I have tried to figure out what this is for, and I saw somewhere that it was a tea sweetener. I thought that was genius so I tried it and couldn't really taste it, and I put a good 2 teaspoons in. I just pour a little on my finger and eat it that way. It's a sweet rosy flavor, and very good. Plus, the bottle looks just like the one in the movie, so... (now realizing I said this way to much-->) why not? 6. Chocolate Frog ~ 9.95: This is a huge hunk of chocolate. There's really nothing more to it. It's not like the chocolate was outstanding, so I wouldn't get it again. However, the box is super cute and it comes with a card so you get your money's worth at least once, but getting this again would be silly. No one needs that much chocolate! 7. Pumpkin Juice ~ 6.99: The pumpkin juice basically tastes like pumpkin cider with lots of spices. A lot of people don't like it, but I loved it! The collectors bottle is sold cold at vending carts in the streets and is so refreshing after a hot day. Highly suggest trying this out, however, it is a bit pricy for a drink. If you want this several times, get the bottle once, and a cheap cup at a restaurant the rest of the time. 8. Pepper Imps ~ 5.95: These are never mentioned in the books, but they were cheap for a lot of candy, so I figured why not? These are cinnamon flavored and they're kind of the consistency of butter mints. I counted about 120 so you really get a ton and a cute jar for cheap. Then again, they weren't that distinct from a name brand cinnamon candy you could find at Walmart, which is why it's so low. Hogwarts Express: You enter through either 'London' or Hogsmeade and wait in line through a remake train station. When you get on the train the booths look exactly like they do in the movie. A bit uncomfortable seating, but it's not too bad. A video plays on the 'window' screen to correspond with the ride. It's also an easy way to travel from park to park. I'd recommend trying this at least once just for the experience. Weasleys' Wizard Wheezes: As you may know, this is the Weasley twins joke shop and it really is incredible. There is so much bright color and it's packed full of trinkets and purchasable souvenirs. It is smaller than it is in the films however, but it's so full of detail that it was worth the visit. 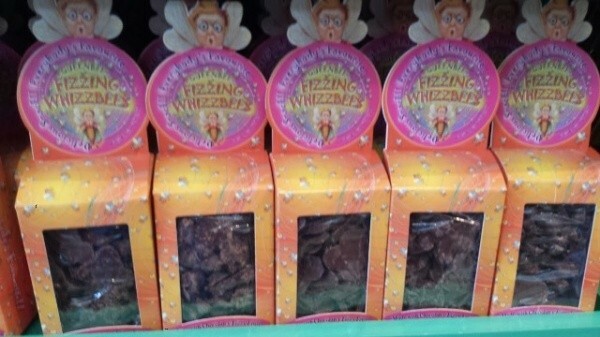 Honeydukes: The candy shop in Hogsmeade is so full of pinks and greens and beautiful, colorful candy. I had a long list of candies I wanted to get here, so this was a fun shopping spree destination for me. I would recommend checking it out and looking around for something you like. Zonko's used to reside next door, but Honeydukes has recently been expanded into it. So the store is larger and aesthetically pleasing. Magical Menagerie: This is a small shop in Diagon Alley that basically is a place where you can purchase many different stuffed animals. I didn't get any, but if you're a Luna Lovegood fan, be sure to check this out and look up for the Crumple Horned Snorkack. Madam Malkin's Robes for All Occasions: I wasn't planning on purchasing a robe, but I came in here to see the robes on display. Some costumes from the set are showcased in dim lighting and glass cases. There is also a mirror that gives you fashion advice (or criticism) if you stand in front of it! Butterbeer carts: If you go to Hogsmeade, these are pretty hard to pass up. Stop by for a refreshing drink (there is more than just butterbeer, I recommend trying the raspberry tea). Ollivander's: The illustrious wand shop is absolutely beautiful with towering walls of wand boxes that are actually from the movie set. There is a wand choosing ceremony at the back of the shop where one lucky person is chosen from a group and chooses a wand by 'casting spells'. With the fun special effects and fantastic impersonation of Ollivander, this is a must visit. Plus, there is a huge collection of wands to choose from. From minimalistic to detail oriented, there's a wand for everybody. Quality Quidditch Supplies: This shop is located in Diagon Alley right when you walk in. The store has some pretty neat Quidditch gear and a uniform on display. Never shown in the films, but it certainly looks like it would be right from the set. Knockturn Alley: This is a pretty creepy place full of dark magic, but is ideal to go in the heat of the day. It is completely shaded and very cool so you have to check it out, especially if you want to get out of that hot Orlando heat! The dragon at night: The famous dragon towering over the Gringotts bank in Diagon Alley breathes fire about 15 minutes at a time. The heat from the flame can be felt even from far below. The real magic is going at night and seeing it. The flame looks so amazingly epic in the dark sky, it's a must see. I also have a video of this above. Phone booth in London: The phone booth is located right outside of the entrance to Diagon Alley and may look very basic but if you go inside and type 62442 (MAGIC) you will be connected to the ministry of magic. I have videos of everything mentioned available above. The Knight Bus: This is a recreation of the Knight Bus from Prisoner of Azkaban located right outside of Diagon Alley. There's not much to it, but you can ask the driver and even the head questions as well as take pictures with them. It's pretty impossible to go to either park and not see any live performances. There are reenactments of The Tales of Beedle the Bard, the frog choir, Celestina Warbeck, and Beauxbatons and Durmstrang. It was so enjoyable to see these things in person and I suggest asking a staff member for a schedule of the performances if there's a certain one you want to see. I saw Fountain of Fair Fortune and The Tale of the Three Brothers which are essentially puppet shows but the puppets are amazingly detailed. The Hogwarts frog choir was an A cappella show featuring a member from each house and two singing toads. Celestina Warbeck is briefly mentioned in Deathly Hallows as Molly Weasley's favorite singer. She is absolutely stunning in her flowing gown and backup singers, also with beautiful dresses. The Beauxbatons and Durmstrang I only saw a portion of, but it was basically a routine where the Beauxbatons danced with streamers. I'm not sure what the Durmstrang students did however. Well that's it! I hope you enjoyed reading and learned more about the Wizarding World of Harry Potter. Hopefully you found some things you wanted to try, visit, or experience. It really is the most magical place in the world and I was so happy to experience so much in only three days. I hope you have fun as well and make lots of fun memories!